(CNN) -- As Norway struggles to come to terms with its greatest loss of life in decades, all eyes are on the man charged in the explosion in central Oslo and the deadly shooting rampage at a youth camp. While police have not officially named him, Norwegian television and newspaper reports have identified the suspect as 32-year-old Anders Behring Breivik, of Norwegian origin. A picture is emerging, gleaned from official sources and social media, of a right-wing Christian fundamentalist who may have had an issue with Norway's multi-cultural society. Norwegian and international news outlets have run photographs of a blond man with blue-green eyes and chiseled features, dressed in a preppy style. 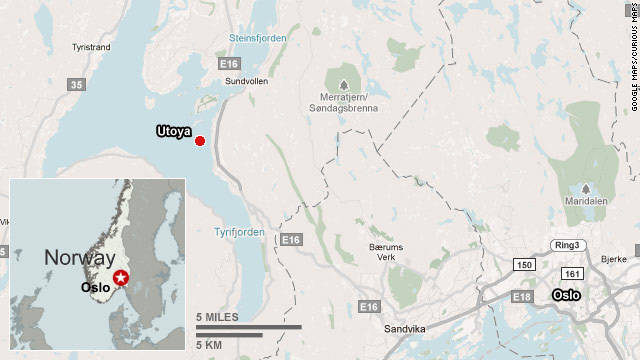 A victim who was shot during the attack at the youth camp on Utoya island told CNN Saturday that he had seen pictures of Breivik taken from what is believed to be his Facebook page and shown on NRK and TV2. The victim said he recognized the man from the news reports as the gunman. Breivik is a member of the Oslo Pistol Club and has three weapons registered in his name, according to leading Norwegian newspaper VG, citing Norway's official weapons register. They are a Glock pistol, a rifle and a shotgun, VG reported. NRK reports that Breivik does not have a military background and was exempt from Norway's mandatory military service. He has not had any special military training, it adds on its website. He was a youth and adult member of the conservative Fremskrittspartiet (FrP) or Progress Party, VG newspaper reports, remaining involved until 2007. The party's most prominent manifesto pledge is to minimize immigration. His membership was confirmed by a senior party member, Jonas Kallmyr, who is quoted by VG as saying that encountering Breivik was "like meeting Hitler before World War II." The leader of the Progress Party, Siv Jensen, told Norwegian broadcaster TV2 News she was "horrified" to learn that the suspect was a former member of her party. "But this is first and foremost an attack against the entire nation. It has affected all of us," she said, saying that her party members stood in solidarity with the youth movement of the Labour Party. A post in Breivik's name on an online forum, Document.no, from December 2009, talks about non-Muslim teenagers being "in an especially precarious situation with regards to being harassed by Islamic youth." "I know of many hundred occasions where non-Muslims have been robbed, beaten up and harassed by Islamic gangs," the post reads. "I had a best friend between the ages of 12-17 who was a Pakistani, so I was one of the many protected, cool 'potatoes' that had protection. But this also made me see the hypocrisy up close and personal and made me nauseous." Such anti-Islamic sentiment is nothing new in Norway or other European nations, where there has been resistance against increasing numbers of Muslims and their practices. About 3% of Norway's population in 2010 -- 144,000 people -- were Muslim, but that was expected to more than double to 6.5% over the next 20 years, according to a report released earlier this year by The Pew Forum on Religion and Public Life. That is one of the largest percentage increases in Muslim populations across all of Europe, thanks in part to fertility rates significantly higher than those of non-Muslims. Another post in Breivik's name in October 2009 advises "Hans", described as the founder of Document.no, to "develop an alternative to the violent extreme Norwegian Marxist organisations Blitz, SOS Rasisme and Rod Ungdom" -- all left-wing movements in Norway. "The conservatives dare not openly express their viewpoints in public because they know that the extreme Marxists will trump them. We cannot accept the fact that the Labour Party is subsidising these violent "Stoltenberg jugend", who are systematically terrorising the politically conservative," the post reads. He is making a reference to the youth movement of Prime Minister Jens Stoltenberg, who heads the Labour Party. A Twitter account attributed to Breivik by Norwegian newspaper Aftenposten has only one message, dated July 17. "One person with a belief is equal to the force of 100,000 who has only interests," it says, adapting a quote from 19th-century British philosopher John Stuart Mill. Police have not ruled out the possibility that other people may have helped the suspect. "The official questioning is starting now," Roger Andresen, a police official, told reporters during a news conference Saturday. The suspect was cooperating with police, making it clear he wanted to explain himself, Andresen said. Norway's police website said the suspect is currently charged with breaking paragraph 147a of the penal code -- a terrorism offense, with a maximum sentence of 21 years. The statement said he was charged in both the Utoya attack and the bombing of government buildings in Oslo, and that the charges might change. "The suspect has never been arrested by the police before," it said. Two addresses connected to the suspect are being searched, police said. One of them is believed to be an apartment in Oslo and the other a farm in Hedmark. NRK reports that Breivik is registered as having run a company that produced "vegetables, melons, roots and tubers" -- an industry which allows access to large amounts of fertilizer, the broadcaster notes, which can be used for explosives. An employee at a Norwegian agricultural cooperative told CNN that the man identified in media reports as the suspect in Friday's attacks bought six tons of fertilizer from her company in May. Oddmy Estenstad, of Felleskjopet Agr, said she did not think the order was strange at the time because the suspect has a farm, but after the Oslo attack she called police because she knew the material can be used to make bombs. More details on the man are sure to emerge in the coming hours and days. But what many Norwegians find hard to comprehend is that the chief suspect in the massacre appears to be one of their own. Stoltenberg stressed that whoever was behind the attacks must be dealt with properly. "It is very important that those who are responsible -- one or several persons -- are sentenced according to Norwegian law, in the Norwegian system of justice," he said. "Norway is a small country but it is a proud country. We are all very close, especially in times like this." CNN's Laura Smith-Spark and Cynthia Wamwayi contributed to this report.